When backstabbing extremely dangerous contestants, do make sure they end up dead. I don't want to see anyone dead, but if it has to be, then being smothered by a soft, silky pillow is a way to go. Where is a popcorn eating emote, because this is going to be good. Also I don't know what'll be worse for Levin, the fact that he couldn't actually ensure the deaths of everyone in his block, or the fact that this will clearly paint his as untrustworthy to anyone naive enough to think his hands were clean. Looks to me like Fox is going to tear Levin to shreds, and we'll get to see how Smiley "terminates" people. If she can old out a little longer, though... I think that "voting" booth might offer a way to get revenge? It reminds me of the Survivor "vote him off the island" mechanic. Murder 101: When ever you try to murder someone, make sure they are really dead. Levin now regrets not building a pillow fort when he had the chance. JUst a thought i s there a diffference between colored pillows and colored floor? could it be that levin is sitting in an inauspicious place? Have to say I'm a little disappointed with the comic lately. I'm still enjoying the story/ characters/ pretty much everything tbh, but there seems to be quite a bit of filler creeping in. For example, 2/3s of today's is pretty unnecessary. 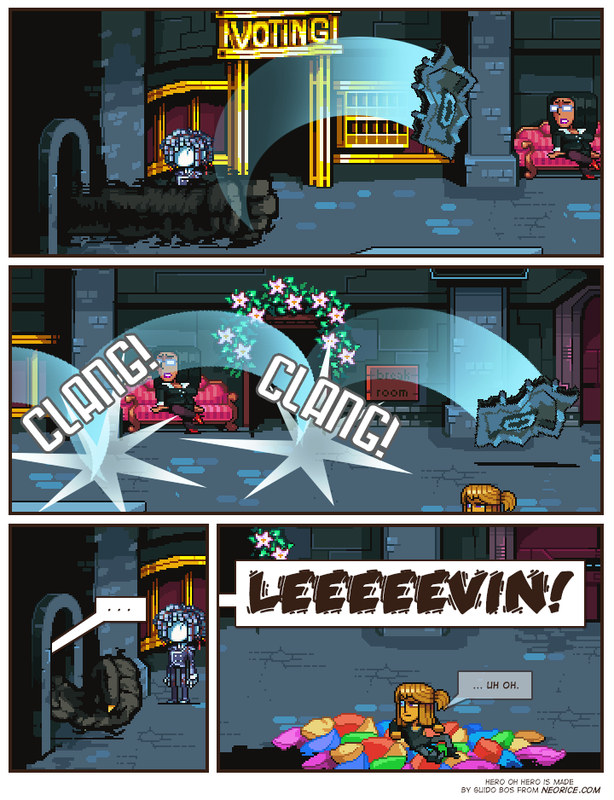 Do we really need to see the door bouncing away, or could that space better be used to show Foxy enter the room and Levin crap his pants (probably tomorrows strip)? I hate to complain because what you've put out has entertained me for years now and is actually a highlight of my working day (sad, right?) but would hate to see the trend continue, or worsen. In my (probably wrong) opinion, I would rather see just the three strips a week with more meaty content, rather than daily updates that are mostly filler. Either way, hope I didn't offend, it's just been a niggle with me lately. Obviously you keep doing you, it's still a great read. Embrace your destiny, Levin. EMBRACE IT! But ain't he sitting on a rainbow coloured "floor" :D How....convenient, wouldn't you say? Criticism is fine, Do keep in mind this comic is purely a passion project I do in my spare time next to my study/work. Fyi the bonus updates are something I decide on afterwards as I have a 250+ page buffer. Usually I throw in more frequent updates cause I feel an arc might feel a bit slow or is longer than others. So something feeling "Fillerish" isn't just something I do to keep up with bonus updates. I feel it'd detract from the comic as a whole not to include these moments & action scenes that kinda focus on the impact of hits and the like, but I do try to keep the amount of times I use them relatively low; as I know dialogue-based scenes tend to go "faster" panel usage wise. Shameful Anon, I have the same complain. But if we were reading it later instead of anxiously waiting for every single new page, I doubt we'd notice the filler this much. @Shameful Anon, Neoriceisgood, UnknownID & 5: Personally I'm on the side that it feels kind of filler-y, but I also hope it would come across as dramatic/rising tension once the entire transition and the following scene has been released. By itself it might not be much, but hopefully it will contribute to the whole. I will agree that I think I would prefer Neorice going down to three pages a week if that is the time he needs to keep the comic up to its standard. In other news it looks like Tobi's return is not going to play out either how I guessed or how I hoped. But it looks like Levin is going to get a bit of karma back, so I'm OK with that. When siphoning funds from extremely dangerous contestants, do make sure they remain ignorant. It must be Levin's deathday. I'm not sure what else Levin was expecting, given his incompetence. Lord Infinite will be pleased. Voting? That spells bad news for someone.